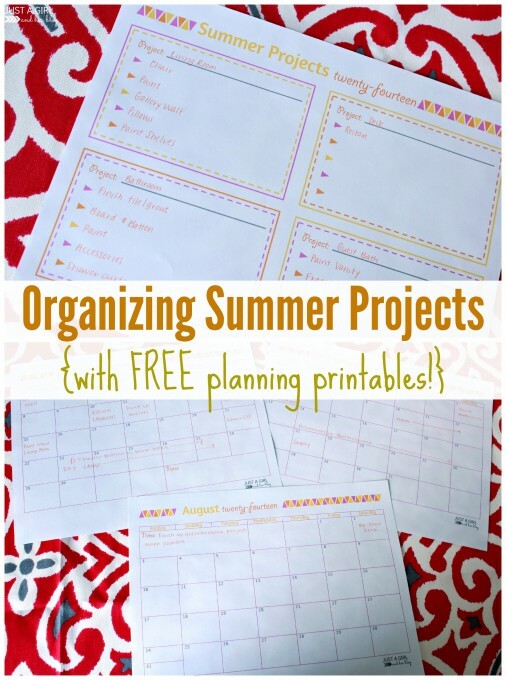 These simple planning printables are perfect for organizing summer projects! 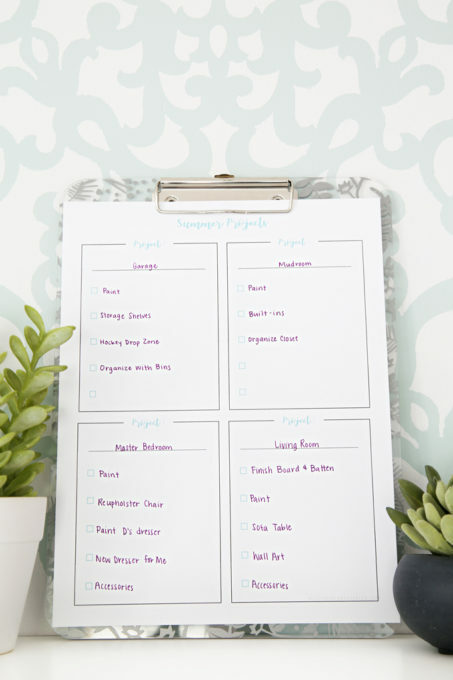 Whether you’re making some updates around the house or have projects planned with the kids, these printables can help you make sure you check off all the items on your to-do list! 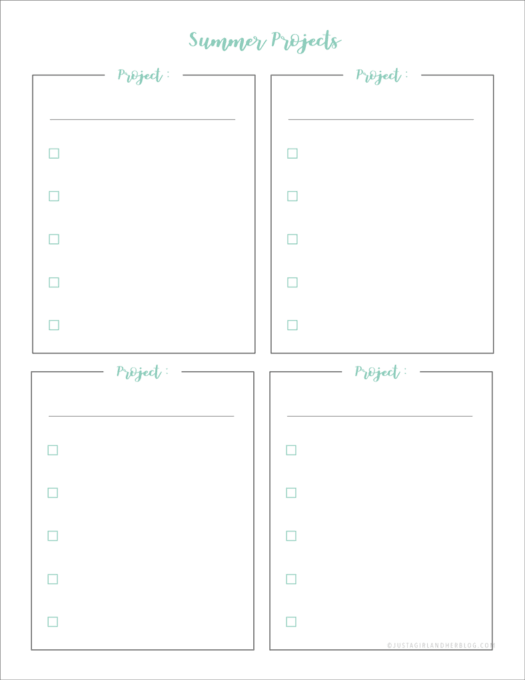 It’s no secret that when I start to feel disorganized or when I feel overwhelmed by my to-do list, the first thing I do is make a printable. When I wanted to make sure our finances were on track? I made a pretty printable budget binder. When I decided that it would be helpful to be able to look at my plans for the week all at once? I made some cute planning pages. When I wanted to motivate myself to work out and eat healthy? Yep, I made a printable for that too! Having all of my information organized in a way that makes sense helps me plan my time and make sure that I don’t forget anything, so of course when I started thinking about our summer projects for the upcoming months, I pulled out my computer and whipped up a few printables to help me get organized! 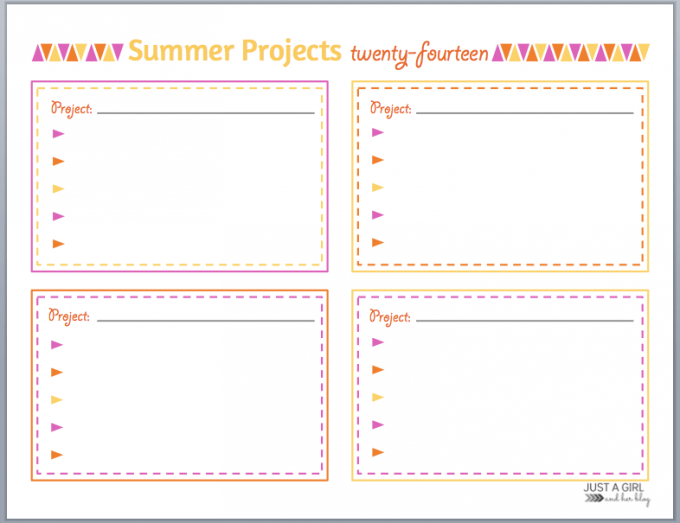 Click here to download the Summer Projects printable! On this first page, I wrote out the major projects I wanted to accomplish this summer and broke them down into steps so I could see what all needed to be done for each project. If you are more ambitious than me and are planning on tackling more than four major projects, feel free to print multiple copies of this first page! So for example, I’m hoping that I’ll finally be able to finish up our living room, and in order to do that I know I still want to: finish the board and batten (that we may or may not have started a few months ago… 😉 ), paint the walls, find the perfect sofa table, add some wall art, and finish it off with the perfect accessories. 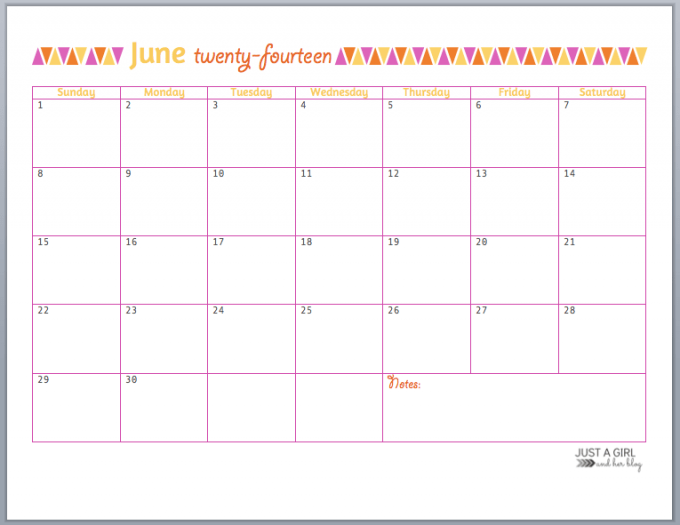 Click here to download the May-August calendar printables! I realize that summer doesn’t technically start until mid-June, but I included May, June, July, and August calendar pages just in case you wanted to get started a little early. The calendars are undated so that you can use them for any year! 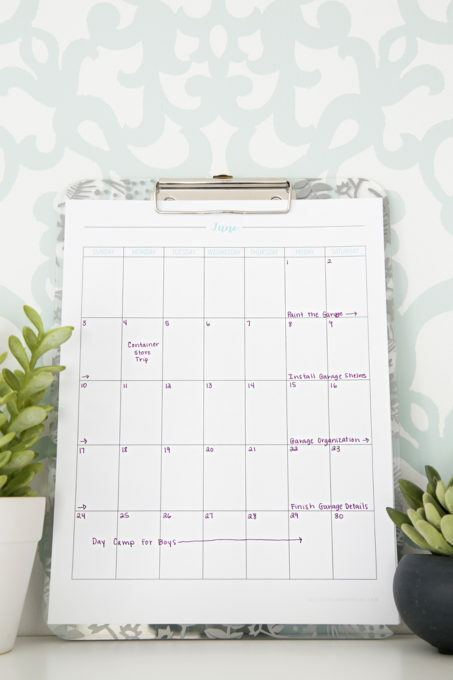 The first thing I did with the calendar pages was go through and write down any commitments we already have this summer– the boys’ day camp, our family vacation, the Haven blogging conference, etc. Once those things were filled in, I could easily see where I had room in my schedule, and I began writing in all of the pieces of my projects on the days I wanted to work on them. I tried to give myself a realistic timeline for each project and even set aside some buffer days here and there in case I end up needing them. I made sure to include every step of every project that I wrote down on my first page somewhere on the calendar so I have a specific time set aside for each item. 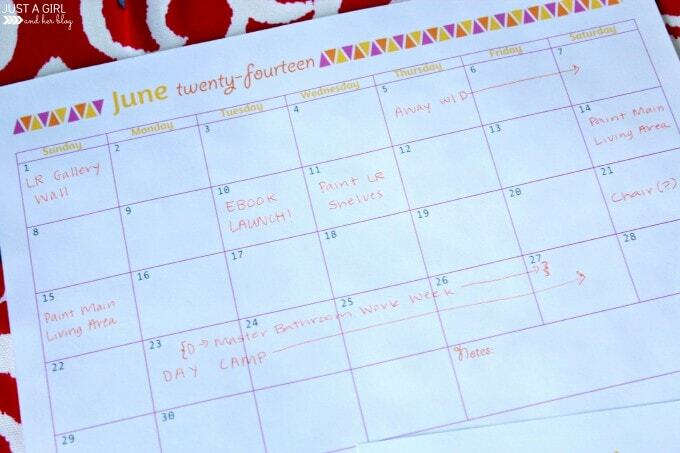 If you have a long to-do list this summer, fire up your printer and get planning! You’ll be amazed at how much more you accomplish if you plan to do it ahead of time. 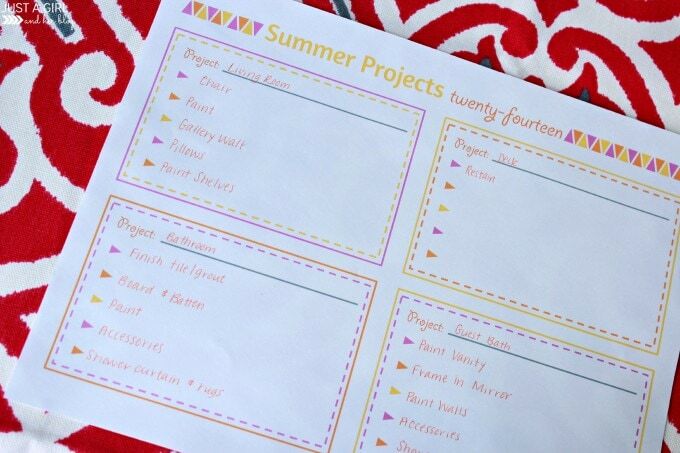 I’d love to hear about the big projects that you have planned for this summer! Let me know about them in the comments section below! The photos below are from a previous version of this post. Love the printables! I am hoping to get a lot of projects done over the summer. Of course, I want to work in the garden and the yard, but I am hoping to get two new bedrooms set up for my daughters. At 11, they finally want their own rooms — I will be giving up my home office for one of the bedrooms. Enjoy your weekend! Sounds like you have a productive summer planned, Lauren! I can’t wait to check out all of your projects! Hope you’re having a wonderful weekend! Our garden (and the addition of a new flock of chickens) has taken up our free time so far, but I hope to do some more work on our family room (mantel update, throw pillows, wall art) and possibly some budget updates to our kitchen. I’m excited to see what the summer holds! Oooh Donnie has always wanted to have chickens! How fun! Sounds like you guys have lots of great plans!! Hope you’re having a wonderful weekend, Kim! That’s frustrating! Congrats on the new house, though! I know moving is a huge job, but setting up a new place can be so fun! I hope they work out a firm date for you soon! Hope you guys are doing well, Andrea!!! I so need this! !, to keep on track and accomplish stuff this summer 🙂 Will be punning, Abby! Thx!! Thanks so much, Kendra! I appreciate the pin! Hope you’re having a wonderful weekend! These will come in very handy!! Thanks Abby! Great printables! 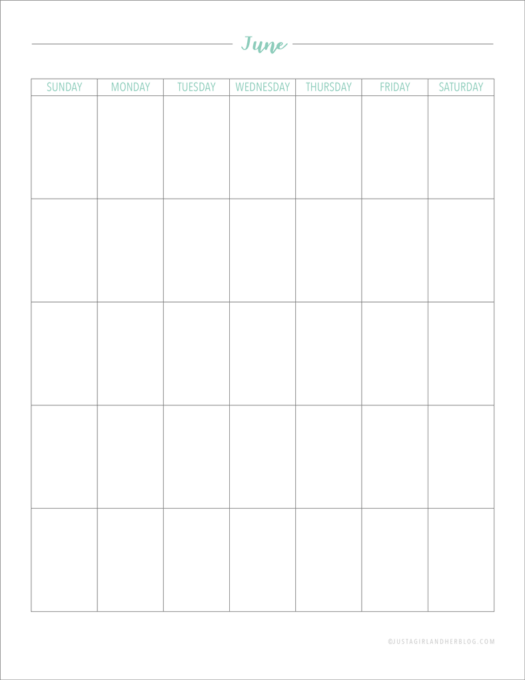 The best way to get anything done is to have a plan and to have a plan work, a calendar will do the trick. I notice that calendars help me procrastinate less than I normally would, especially in the summer time. Thanks for sharing! Thanks so much, Catherine! I agree– it’s important to have a plan! Hope you’re having a great week! I love a good printable! Thanks for this Abbey. I think this will come in quite handy to organize my projects for my days off work. Summer hours are great!! Yay! So glad it was helpful!! Hope you’re having a great week, Jennifer! You have such a great site! I am really appreciating all of your fabulous ideas and use of WORD. My site is under construction and I am looking at what others are doing to get some ideas about design and content. I just wanted to say your site is just great and has given me some good ideas and thoughts on direction. Thank you so much for your sweet words, Linda! I always love finding other fans of Word! 😀 Good luck with your site! Hope you’re having a great week! 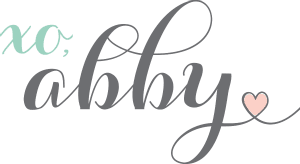 Abby, I am starting my own blog and wanted to see if I can use your free printables and mention you in my posts you have great stuff and I’d love to share it! Hi, Ashley! Thanks so much for your sweet words! I would be honored to be mentioned on your blog!! Hope you have a great night! Lol! Thanks for the heads up, Angel! I will add it to my list! I am so excited about summer!!!! Love reading the summer posts to get me in the mood 🙂 Though we’re finally just starting to experience spring here. Yesterday my toddler had a blast being outside and splashing in puddles. Love those simple moments with her! It was 80 here this past weekend and now we’re getting snow two different days this week. So ready for the warm weather to arrive! 🙂 Hope you’re having a great week! These printables are so so cute! I’m terrible at planning and having the proper planning tools on hand help me a lot. I’m starting to practice the habit of writing down what’s on my head a lot more than I used to. Knowing what actually needs to be done, helps me feel less overwhelmed. Thank you so much for these! I love them because I tend to write these ideas on a sticky note and then it gets lost. Now I can make it more efficient with less stress, ha.